PRINCETON, NJ -- Americans' views of seven industries are substantially improved this year, based on increases of 10 points or more in the industries' net positive ratings. The banking, travel, and real estate industries show the greatest improvements. Healthcare is the only industry to see a decline of at least 10 points, although the retail, computer, and pharmaceutical industries were close to that threshold. The results are based on Gallup's annual Work and Education poll, conducted Aug. 7-11. Each year since 2001, Gallup has asked Americans to rate 25 different business sectors and industries on a five-point scale ranging from "very positive" to "very negative." The net ratings are the difference between the positive and negative ratings for each industry. Broader improvement in the economy and increased consumer confidence may be behind the more positive ratings of the banking, real estate, travel, airline, and automobile industries. Despite improving the most this year, the banking industry continues to be rated more negatively than positively by Americans. But its ratings are the best since 2008, a month before the financial crisis threatened the existence of AIG and other major financial institutions. 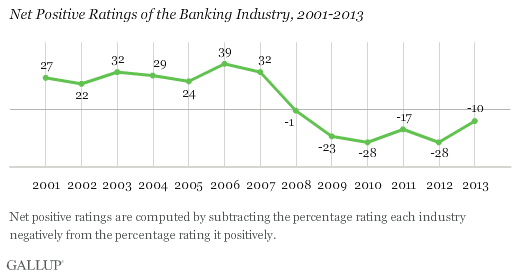 And prior to the 2008-2009 recession, Americans had a significantly more positive than negative view of banking. The improvements in ratings of the real estate industry likely are due to the recovery of the housing market from the depths of the housing crisis. Now, about as many Americans view that industry positively as negatively, for the first time since 2007. This year's decline in ratings of the healthcare industry may be partly explained by a normalizing of its ratings after a sharp increase last year. The increased negativity may also be related to increased news media coverage of the Affordable Care Act, as some of its major provisions are set to go into effect in the coming months. 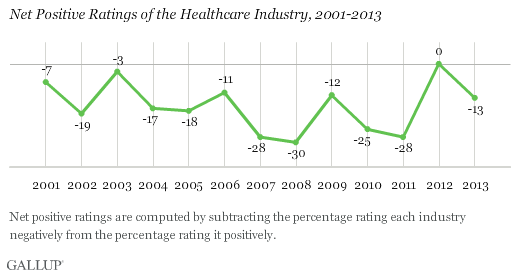 The healthcare industry has never been rated more positively than negatively, although even with this year's decline, its ratings currently are better than they were for much of the last decade. Ratings of the computer industry declined this year, after a record year last year. In 2012, 73% of Americans rated the computer industry positively, the highest for any industry in any year. This year, positive ratings of computers are down eight percentage points to 65%, accounting for most of the nine-point decline in the industry's net positive rating. Despite the decline, the computer industry remains the most positively rated industry overall, with a +54 net positive rating. The restaurant industry and farming and agriculture are rated the next-most positively. At the other end of the spectrum, Americans are most negative toward the oil and gas industry and the federal government. A majority of Americans rate each negatively, the only two with that dubious distinction. The computer industry has had the highest net positive rating each of the last six years. Since 2001, either the computer or the restaurant industry has topped the list. The oil and gas industry has most commonly been the poorest-rated industry; it has been last or statistically tied for last in all 13 years the question has been asked. The federal government has ranked at the bottom with the oil and gas industry each of the last three years. Americans' ratings of several industries are more positive this year than last, particularly banking, travel, and real estate. Both banking and real estate have more ground to make up to return to their formerly positive ratings from before the recession, housing, and financial crises. But they are at least back to where they were when the recession started. At the same time, a number of industries' images declined in the last year, in particular healthcare, but also the retail, pharmaceutical, and computer industries. 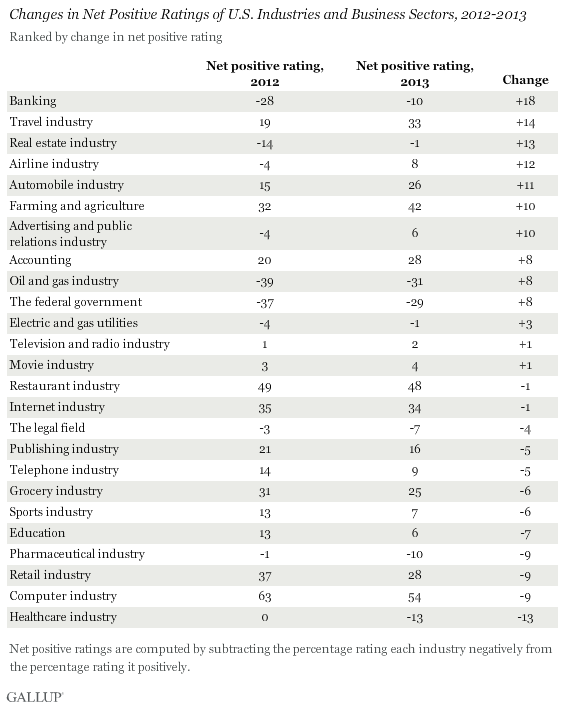 Most industries' ratings suffered during the recession. 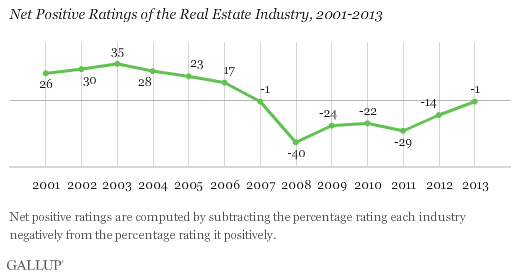 In 2008, 13 industries had net negative ratings. That number is down to eight this year, including real estate and electric and gas utilities, with scores of -1. Thus, as the economy has shown signs of improvement, Americans' views of many U.S. industries have improved. So a healthier economy will likely boost industry ratings, in addition to the effects from more industry-specific improvements that have occurred recently in the real estate and automobile industries. Results for this Gallup poll are based on telephone interviews conducted Aug. 7-11, 2013, with a random sample of 2,013 adults, aged 18 and older, living in all 50 U.S. states and the District of Columbia. Each respondent rated a subset of 13 of the 25 industry ratings, resulting in rating by roughly 1,000 Americans for each industry. Less than two months before the health insurance exchanges open, more Americans disapprove than approve of the healthcare law and many remain unfamiliar with it. The young, who are key to the law's success, know the least about it. Americans are most satisfied with the federal government's work in responding to natural disasters (75%) and with national parks (68%). They are least satisfied with its handling of the nation's finances (14%) and poverty (19%). Most Americans either own a home and will continue to do so (56%), or don't own a home but plan on buying one (25%). Eleven percent don't own a home and have no plans to buy one; 3% own a home but plan on selling it and renting. Is Your Vendor Relationship Strategic? How well do you work with your suppliers and vendors? Learn strategies from The Golden Thread to improve these vital business relationships.